Testimonies provided by Christians to a fact-finding team show a surge of communal attacks – threats, violence and persecution – against the community. On May 25, 2016, Saradi Bai, an elderly Christian woman from Bhadhisgaon village in Chhattisgarh’s Bastar district, died a natural death. But in the days that followed, an chain of unnatural, divisive events flooded the tribal hamlet. Soon after she died, the local unit of Bajrang Dal, a militant Hindutva organisation active in several parts of India, led a campaign to deny her a rightful burial. Led by local Hindutva activists, the group said that Christians could not be allowed to carry out their religious rituals, bury her in a casket or place a cross in her grave. They argued that any Christian ritual is a violation of section 129 (C) of Panchayats (Extension to Scheduled Areas) Act, 1996 (PESA), which gives the gram sabha “the power to safeguard and preserve the traditions and customs of the people, their cultural identity and community resources and customary mode of dispute resolution”. In the last two years, the sudden burst of Hindutva aggression in the region, especially under the stewardship of the Bajrang Dal, has unnerved Christians. But denying basic burial rights to an elderly woman left the minority community flabbergasted like never before. With no other alternative, Saradi Bai’s family were forced to seek police intervention. After hectic negotiations through the day, the Bajrang Dal allowed her to be buried in a coffin but without a cross on her grave. It also said that no Christian burials will be allowed in the village henceforth. This event that polarised the village on religious lines prompted around 200 Christians of the village to appeal at the constitutional offices of the sub-divisional magistrate (SDM), tehsildar, police and sarpanch asking for a separate burial ground for Christians. “The sarpanch refused to accept our application, while the SDM and others are yet to respond,” said pastor Pilaram Kawde of Bhadhisgaon while talking about the state government’s apathy. Meanwhile, Saradi Bai’s husband Sukhdev Netam died on June 6, leading to yet another round of similar events in the village. “They (Bajrang Dal activists) declared that they did not recognise the authority of the police, tehsildar, SDM or anyone else,” said Kawde. Netam was finally buried while the police kept guard. This time, the Bajrang Dal went a step ahead and threatened to kill if the community tried to bury Netam. The communal attacks against Christians in the village began around September last year. Kawde laid the foundations for a prayer hall on his own land, for which he has all the papers. However, the panchayat, under the influence of the Bajrang Dal according to Kawde, refused to give him a no objection certificate (NOC). “The panchayat orally refused to issue a NOC for construction. I asked them to give me the order in writing. When they failed to do so for several days, I resumed construction. I was then given a written notice citing sections 55 (1) and 55 (2) of the Chhattisgarh Gram Panchayat Act 1993 saying I cannot be allowed to construct a place of worship for Christians because ‘people of big-big castes and religions live in this village, and every Dusshera even the Roopshila Devi Ma joins the celebrations,’ and that the panchayat has the right to demolish the prayer hall,” Kawde said. This attack on the Christian community in the Adivasi-dominated Bastar region is not an isolated one. Kawde claimed that Christians in many other villages have been prevented from burying their dead, fueling a demand for separate burial grounds among the community. Several other narratives of this kind were brought to light in a recently published fact-finding report by the All India People’s Forum (AIPF), a collective comprising a few political, non-governmental and student organisations. The AIPF team comprised former Madhya Pradesh MLA Sunilam, former Jharkhand MLA and CPI(ML) member Vinod Singh, All India Progressive Women’s Association secretary Kavita Krishnan, Brijendra Tiwari of the All India Central Council of Trade Unions (AICCTU), Amlan Bhattacharya of the People’s Union for Civil Liberties (PUCL), and lawyers Aradhana Bhargava, Ajoy Dutta and Amlendu Choudhary. The team was assisted and accompanied by Bastar-based researcher Bela Bhatia and Dantewada-based activist Soni Sori. The report, which also documented many testimonies of people highlighting large-scale human rights’ violations by the police and state-sponsored vigilante groups, raised several such incidents where Christians have been systematically targeted by Hindutva groups in southern Chhattisgarh, also the hotbed of the Communist Party of India (Maoist)’s operations. The fact-finding team found that that at several villages in Bastar – including Karmari, Bade Thegli, Sirisguda and Belar – section 129 (C) of the Chhattisgarh Gram Panchayat Act have been wrongly invoked by the supporters of Hindutva to restrict access of Christians in villages where they have been living for centuries. Following PESA’s enactment in 1996, the Panchayati Raj rules applies to the scheduled areas like Bastar. Originally an empowering Act to give the Adivasi-run gram sabha the powers to take its own decisions, the Hindutva groups, in the last few years, have used PESA’s provisions to equate Adivasi customs and traditions with the Hindu religion in order to prohibit non-Hindu practices. Apart from section 129 (C), they have often used section 55 of the same act, which has provisions to prevent land alienation in scheduled areas, stipulating that prior permission of the panchayat is needed to build new houses, change the design of the houses and so on, according to their political convenience. Bajrang Dal or land mafia? Most victim testimonies in the report suggest a nexus between the regional land mafia and the Bajrang Dal. In most cases, the Bajrang Dal has attacked spaces which the Christians use for social gatherings. For instance, in the Karmari village of Bastar, Christians were stopped by the Bajrang Dal from constructing a community hall in their rightfully-owned ancestral land. The gram panchayat gave an NOC for the hall, but made a U-turn when construction actually started in June 2015. “…I was summoned by the gram panchayat to explain the construction. I told them I had the NOC and that I wanted to construct a community bhawan because Christians do not have a hall for social gatherings like marriages and so on. The panchayat leader told me I was not allowed to construct the building. If the governor and other authorities upheld my right to construct, they said they could call the Bajrang Dal to get me beaten up,” said pastor John Masih of Karmari. He added that when he went ahead with the construction the Bajrang Dal held a rally, pressurised other villagers to participate and gheraoed the police station. The SDM stopped the construction after the protest. But when he showed all the documents, the collector issued a letter of permission for the construction. Refusing to budge, the gram sabha held a meeting in September 2015, ostensibly to discuss drought relief. Masih said that the panchayat leaders mobilised the crowd to stop construction of the hall. Met with a violent protests at the construction site, Masih ran away. “But two women – Ludri and Phulo Baghel – who were working at the site were badly beaten with bamboo sticks, kicked and punched. They surrounded us and did not let us go out of the village,” said Masih. The police did not come to the site despite several calls. Masih said when they finally came, it named only four assailants in the FIR while he had given 12 names. The accused persons are out on bail now. Masih said that he was told by the sub-inspector of the station that he cannot protect them because ‘one community’ is increasing too much. The report also talked to victims of similar attacks by the Bajrang Dal in Ara village of Balrampur in northern Chhattisgarh, Karkapal and Mudhota villages in Bastar. Son Singh Jhali, the lawyer who is handling a number of such cases, explained how a mob of around 25 Bajrang Dal activists vandalised a church in Ara. “On June 5, 2016, the mob led by Chhotu Jaiswal, Sonu Gupta, Bipin Gupta, Chhotu Gupta and others attacked the church during Sunday prayers. They vandalised the church; beat up the pastor, his wife and three others. They made a video of the attack and circulated it on social media…The pastor and his wife were illegally detained for two and half days…No FIR was registered against the assailants – instead a case (with charges of conversion, rioting, etc.) has been registered against the pastor who still languishes in jail,” said Jhali. 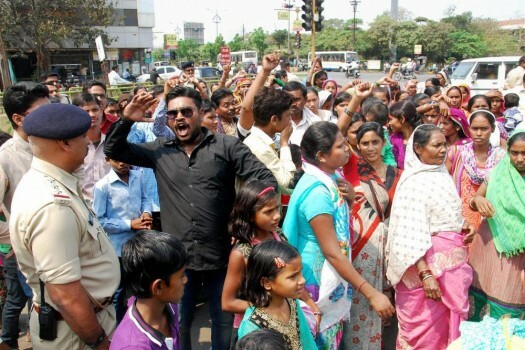 “There are several false cases of rioting against Christian pastors. In fact, any complaints against those who attack Christians are immediately followed by counter-complaints,” he added. Similarly, pastor Abhimanik narrated a 2014 incident in his village Mudhota. “A mob of 35 entered the church and beat up everyone, including women and children, and told them to become Hindu or else prepare to be killed.” The pastor said that following this round of violence, the police organised a meeting between the two groups. But the meeting was hugely skewed in favour of the Bajrang Dal, which had mobilised around 400 of their activists as opposed to only 70-75 Christians. The meeting was supposed to be held in the presence of the police, but the police did not come. “They (Bajrang Dal activists) then attacked the Christians, chased them into the jungle; several were badly injured,” he said. The pastor said that the mob did not let the police and the ambulance enter the village. When the injured finally managed to reach the government hospital without an ambulance, the doctors refused to treat them because “the hospital (staff) was threatened and under pressure”. The report also documented the attack on Christians in Karkapal village of Jagdalpur. Pastor Munne Lal Pal narrated how despite necessary permission to build a boundary wall in their traditional graveyard, the Bajrang Dal demolished it, citing that the land has been encroached upon. “They kicked and danced on the graves, raising Jai Shri Ram slogans…Three graves were also flattened. The authorities present did nothing to stop the attackers.” He said that the police did not file our complaint till some 60 pastors and hundreds of community members protested at the police station. The report said that many Hindutva groups have attacked Christians in several other villages. In Tumasnar village of Kanker, they were beaten up for standing up to extortion activities by Bajrang Dal members during Hindu festivals. In this village, the Christians allege that a Hindutva group has been telling villagers to boycott the Christians socially and economically, threatening them with violence if they did not comply. In Sirisguda of Bastar, Christians were stopped from using the government ration shop. The proprietor of the shop was threatened by the Bajrang Dal members. The panchayat secretary, who is a BJP activist, refused to acknowledge the food inspector’s intervention in the matter. Later, many Chrisitans were beaten up for filing a complaint at the inspector’s office. Such was their boycott, that the gram sabha passed a resolution on May 17, 2014 saying that non-Hindus cannot live in the village. However, the Bilaspur high court deemed the gram sabha order unconstitutional. Similarly, in Parapur village of Bastar, many Christian women were beaten up brutally for allegedly doing “witchcraft” on Hindus. The police, according to the report, is strongly complicit with the Bajrang Dal’s activities against Christians in Bastar. The state administration has failed to take any commensurate action. The report notes that the Hindutva groups operate with a great degree of impunity under the BJP-led state government. The violence unleashed by the Hindu right in Chhattisgarh has manifold consequences. One, it seeks to subvert the laws that empower Adivasi groups and give them decision-making powers. Two, the incidents suggest a gradual overtaking of community organisations like gram sabhas by Hindutva groups like the Bajrang Dal, resulting in a false, ahistorical branding of tribal heritage as part of the ‘Hindu’ culture. Three, the physical violence unleashed by the Hindu right on non-Hindus living in Bastar for centuries is matched with the stronger degree of social and economic violence, pushing the minorities to live in a climate of insecurity and fear. Four, more often than not, the Hindutva campaign is a larger story about land grab and displacement of Christians. Five, the incidents reveal how the relief systems have been duly subverted in Chhattisgarh. The high court decision to uphold the constitutional right of people to practice their own religion and prevent communal interpretations of PESA has given some hope to the minority community in Chhattisgarh. Yet, the state government has a lot to answer for the unruly mobs that enjoy immense impunity under the BJP regime.